Description Photo yellowing. Gift of Minnie Aline. 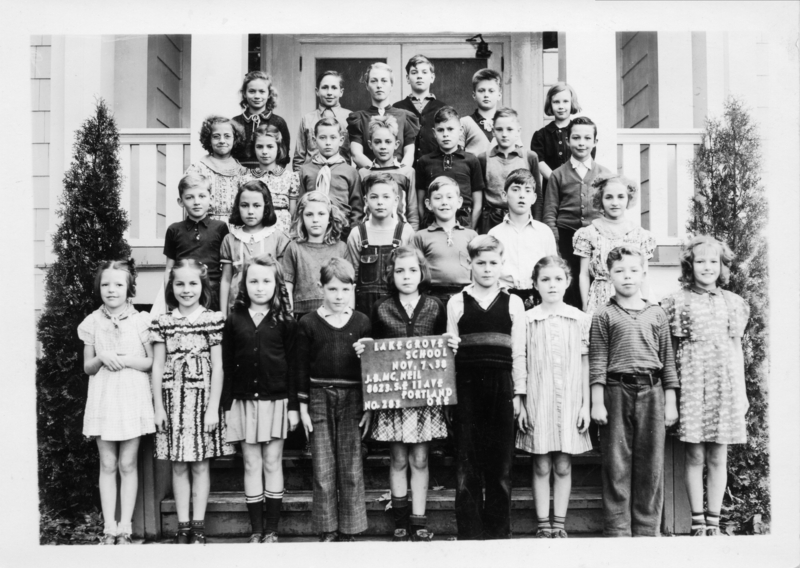 Fourth grade class, Nov. 1938. Mrs. Pauline Van Zante, teacher. First row, left to right: Joanne Niesen, Carolyn Ann Murphree, Minnie Jean MacLennan, George O'Hara, Marian Morris, Joe Woolery, Eleanor Sovey, Henry M. ?, Yvonne McCauley. Second row, left to right: ?, Joanne Williams, Annabelle Alley?, ?,?,?,?. Third row, left to right: ?, Georgeanne Thien, ?, Calvin Watson (Willis Calvin Watson), Edward Erickson, ?, Jimmie Promitas. Fourth row, left to right: Virginia Worthington, Oliver Collins, Mrs. Van Zante, Michael Hoggan, George Kruse, Bessie Gray. [on front] Lake Grove School, Nov 7, '38. J.B.McNeil, 8623 S.E. 11 Ave., Portland, Ore. [photographer] No. 283.